The peoples of the socialist countries and the revolutionary forces all over the world were greatly alarmed about the fate of socialism in Hungary. Soviet troops were stationed in the People’s Republic of Hungary, but the Khrushchev group hesitated to send them into action. Only in the face of the great pressure from below and, especially when it saw that Hungary was slipping out of the sphere of its influence, was it finally obliged to permit the Soviet Army to suppress the armed counter-revolution. This counter-revolution was crushed. The Hungarian counter-revolution was the offspring of revisionism, supported by the imperialists. The Yugoslav revisionists, the most ardent supporters of the Hungarian revisionists, flew their flags at half mast when it failed. Tito termed it «a people’s uprising» which was suppressed by «a savage and impermissible intervention». Imre Nagy, the head of the counter-revolution, found refuge at the Yugoslav Embassy in Budapest. After the defeat of the counter-revolution, the Soviet leadership, which was no less to blame than the Tito clique for its preparation, tried in every way to cover the traces of its grave responsibility. It sacrificed Imre Nagy, whom it had itself placed at the head of the Hungarian state. Unlike the Titoites, it was obliged to call the uprising «counter-revolutionary», as it was in fact. However, it blamed the «dogmatists» and not those who really were to blame — the revisionists, for bringing about the counter-revolution. Khrushchevite revisionists had done in their country, deceiving the revolutionary Hungarian working people. * Editorial of «Zëri i popullit», October 30, 1956. ** Declaration of the Government of the PRA, November 3, 1956. «Zëri i popullit», November 4, 1956. The PLA drew important lessons from what happened in Hungary for its activity on a national and international scale. * Editorial of «Zëri i popullit», November 5, 1956. 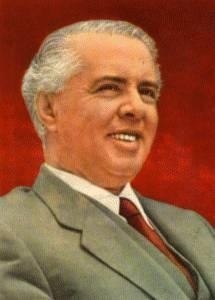 ** Enver Hoxha, Speech delivered at the November 8, 1956 commemorative meeting, Works, vol. 14, pp. 123, 126, Alb. ed. In our opinion, the counter-revolution in Hun gary was mainly the work of the Titoites. In Tito and the Belgrade renegades, the U.S. imperialists had their best weapon to destroy the people's democracy in Hungary. After comrade Khrushchev's visit to Belgrade in 1955, no more was said about Tito's undermining activity. The counter-revolution in Hungary did not break out unexpectedly. It was prepared for, we might say, quite openly, and it would be futile for any one to try to convince us that this counter-revolution was prepared in great secrecy. This counter-revolution was prepared by the agents of the Tito gang in collusion with the traitor Imre Nagy, in collusion with the Hungarian fascists and all of them acted openly under the direction of the Americans. The scheme of the Titoites, who were the leaders, was for Hungary to be detached from our socialist camp, to be turned into a second Yugoslavia, be linked in alliance with NATO through Yugoslavia, Greece and Turkey, to receive aid from the U.S.A. and, together with Yugoslavia and under the direction of the imperialists, to continue the struggle against the socialist camp. The counter-revolutionaries worked openly in Hungary. But how is it that their activities attracted no attention? We cannot understand how it is possible for Tito and Horthy's bands to work so freely in a fraternal country of People's Democracy like Hungary where the party was in power and the weapons of dictatorship were in its hands, where the Soviet army was present. We think that the stand taken by comrade Khrushchev and the other Soviet comrades towards Hungary was not clear, because the greatly mistaken views which they held about the Belgrade gang did not allow them to see the situation correctly. The Soviet comrades trusted Imre Nagy, Tito's man. We do not say this for nothing or without good grounds. Before the counter-revolution broke out and when things were boiling up at the <<Petöfi Club>>, I happened to pass through Moscow, and in conversation with Comrade Suslov told him what I had seen on my way through Budapest. I told him, too, that Imre Nagy was deserting and was organizing a counter-revolution at the <<Petöfi Club>>. Comrade Suslov categorically opposed my view, and in order to prove to me that Imre Nagy was a good man, pulled out of his drawer Imre Nagy's fresh <<self-criticism>>. Nevertheless, I told Comrade Suslov that Imre Nagy was a traitor. We wonder and pose the legitimate question: Why do Comrade Khrushchev and Soviet comrades pay frequent visits to Brioni to talk with the renegade Tito about the Hungarian events? If the Soviet comrades were cognizant of the fact that the Titoites were preparing for a counter-revolution in a country of our camp, is it permissible for the leaders of the Soviet Union to go and talk with an enemy who organizes plots and counter-revolutions in socialist countries? As a communist Party, as a state of People's Democracy, as a member of the Warsaw Treaty and of the socialist camp, we are justified in asking Comrade Khrushchev and the Soviet comrades why so many meetings with Tito at Brioni in 1956, with this traitor to Marxism-Leninism, and not a single meeting with our countries, not a single meeting of the members of the Warsaw Treaty? When will the members of this Warsaw Treaty meet, if not when one of our countries is in danger? Whether to intervene or not to intervene with arms in Hungary is, we think, not within the competence of one person alone; seeing that we have set up the Warsaw Treaty, we should decide jointly, because otherwise it is of no use to speak of alliance, of the collective spirit and collaboration among the parties. The Hungarian counter-revolution cost to our camp blood, it cost Hungary and the Soviet Union blood. Why was this bloodshed permitted and no steps taken to prevent it? We are of the opinion that no preliminary steps could be taken so long as Comrade Khrushchev and the Soviet comrades placed their trust in the organizer of the Hungarian counter-revolution, the traitor Tito, so long as they set so little value on the absolutely necessary regular meetings with their friends and allies, so long as they considered their unilateral decisions on matters that concern us all as the only correct ones, and so long as they attached no importance whatsoever to collective work and collective decisions. The Party of Labor of Albania is not at all clear about this matter, how things developed and what decisions were taken. At a time when the Titoites are conducting taIks at Brioni with the Soviet comrades, on the one hand, and feverishly organizing counter-revolutions in Hungary and Albania, on the other, the Soviet comrades make not the slightest effort to inform our leadership, at least as a matter of form since we are allies, on what is happening or on what measures they in tend to take. But this is not a case of formality. The Soviet comrades know only too well what the Belgrade gang thought of Albania and what intentions they cherished. In reality, not only is this stand of the Soviet comrades to be condemned but it is also incomprehensible. Hungary was a great lesson for us, for what was done, and for the drama that was played on the stage and behind the scenes there. We believed that the Hungarian counter-revolution was more than enough to show the betrayal of Tito and his gang. We know that many documents are kept locked away and are not brought to light, documents that expose the barbarous activity of Tito's group in the Hungarian events. Why this should happen we do not understand. What interests are hidden behind these documents which are not brought to light but are kept under lock and key? To condemn Stalin after his death, the most trifling items were searched out, while the documents that expose a vile traitor like Tito are locked away in a drawer. But even after the Hungarian counter-revolution, the political and ideological fight against the Titoite gang, instead of becoming more intense, as Marxism-Leninism demands, was played down, leading to reconciliation, smiles, contacts, moderation and almost to kisses. In fact, thanks to this opportunist attitude, the Titoites got out of this predicament. Let us start with Hungary. 1. — The Hungarian counter-revolution was begun by a few intellectuals and students. Lacking the influence of a genuine Marxist-Leninist party, those vacillating strata became reserves of the counter-revolution and its assault squads under the direction of the bourgeoisie. The Hungarian writers were in the vanguard of this counterrevolution. 2. — Despite the revolutionary traditions inherited from the proletarian revolution of 1919, the Hungarian working class and that of Budapest in particular, did not know how to defend its power and gains. On the contrary, a considerable part of the working class, especially in Budapest, was activated in favour of the counter-revolutionaries, hence it became a reserve of reaction. This means, in other words, that the work of the Hungarian Workers' Party was superficial and without any real base. The working class did not fully recognize it as its own leader. This was the greatest and most dangerous evil. 3. — The counter-revolution entirely liquidated the Hungarian Workers' Party within a few days, while the counter-revolutionary Janos Kadar issued the decree for its official dissolution. 4. — During the few days of the counter-revolution in Hungary many bourgeois, capitalist and fascist parties popped up immediately, like mushrooms after rain. Thus, the Hungarian counter-revolution was put down by means of Soviet tanks. Under the dictate of the Khrushchevite revisionists, the same traitor who liquidated the party issued the other decree for the refounding of the allegedly new «Marxist-Leninist» party, the Hungarian revisionist party, even more rotten than the previous one. The Hungarian counter-revolution was put down by the counter-revolutionaries. Thus, the two wings of the putsch were bound to come together, as they did, to build «their own Hungary», as they did, to restore capitalism, as they are doing. Drawing lessons from the bloodshed and, after having paid an indemnity in blood for its hasty actions, Hungarian reaction is now carrying out its reforms of radical capitalist transformation at its leisure, regardless of and without any trouble from the Soviet forces and tanks which remain on Hungarian territory. The Hungarian bourgeoisie is, so to speak, going about its business, this time under the protection of Khrushchevite tanks. Under the disguise and «banner of the Party», the Hungarian capitalist bourgeoisie, hostile to the working class, is lulling the working class to sleep while forging new chains for it. The capitalist bourgeoisie has the old intelligentsia and new revisionist intelligentsia, in complete identity of views and unity of action, as its vanguard. At the last meeting of the NATO Council, the organization of counter-revolutions in socialist countries, to divide these countries and to undermine the people’s state power from within, was considered as the best and most feasible method of this war. In the scheme of their general conspiracy against the Soviet Union and the other socialist countries, the counterrevolution in Hungary, which was intended to overthrow the people’s power and replace it with the power of the large estate-owners and the capitalists, with the Horthyfascist dictatorship, had an important role to play. The interference of the imperialists in Hungary is the principal factor of the counter-revolution. Long ago they organized bands of inveterate criminals, Horthyites and fascists, whom they smuggled into the territory of the People’s Republic of Hungary during their preparation for the counter-revolution. They organized an unbridled propaganda campaign against the Soviet Union, against the socialist camp, against the Hungarian Workers’ Party, against the people’s power in Hungary. Numerous facts speak clearly now about this blatant intervention on their part in Hungary. The activity of the imperialists found the support of the internal enemies, the enemies of the people’s state power, the enemies of the working class. Horthyite forces were in considerable numbers in Hungary. The class enemy, dispossessed but not done away with, was not sleeping during these 12 years of people’s power but working and awaiting the opportune moment to launch an attack, with the aid of the imperialists, against the People’s Republic of Hungary in order to overthrow the state power of the people and to re-establish its own capitalist state power. Internal reaction was able to preserve its forces and organize itself even under the conditions of the existence of the people’s power in Hungary, and then to pass on to open attacks, up to an armed uprising, because of the weakness and lack of vigilance of the former leaders of the Hungarian party and state. It is a wellknown fact that during the stage of transition from capitalism to socialism the antagonistic classes do not disappear, that the class enemy is at work and uses every means to fight the people’s power. To suppress the enemy, the dictatorship of the proletariat and revolutionary vigilance must be strengthened. An important role in the Hungarian events, in preparing for and launching the counter-revolution, was played by the anti-Marxist opportunist elements, the traitors within and outside the ranks of the Hungarian Workers’ Party, headed by Imre Nagy. This is not the first time the imperialists have used the Rightist forces, the opportunists, the deviators and traitors, in their fight against the workers’ movement, against the communist movement. The case of Hungary is a further proof of the mobilization of all the forces hostile to socialism in the service of imperialism. At the same time, it must be emphasized that the errors of the former leaders of the Hungarian party and state, which created situations that were not good, had aroused great dissatisfaction among the labouring masses, and this was turned to good account by the counterrevolutionaries. Failure to recognize the forces of reaction and the concessions which were made enabled the enemy, under the pretext of combating the mistakes which could and ought to have been corrected within the framework of the people’s power, to deceive the working masses and to launch their savage and bloodthirsty counter-revolution. But in spite of all these things, the schemes of the enemy were foiled. The counter-revolution in Hungary was crushed. Responding to the appeal of the Hungarian workers’ and peasants’ government, the Soviet Union helped the Hungarian people to crush their enemies, to save their freedom, independence, their people’s state power and socialism. By helping the Hungarian people in their fight against imperialism and their internal enemies, the Soviet Union discharged a lofty internationalist duty, and at the same time, performed a very great service for the cause of socialism and the whole world communist movement. Assessing the Hungarian events as they were, as a counter-revolution launched by the imperialists in collusion with the class enemy and anti-Marxist elements and traitors to the working class, like Imre Nagy and Co., our Party maintained a decisive and correct Marxist-Leninist stand. Our Party’s correct assessment was fully confirmed. Any assessment of the Hungarian events which is not made from the viewpoint of the class struggle is incorrect, anti-Marxist, and inflicts grave damage on the cause of socialism, aids and abets the enemies of socialism, and is a hostile attitude opposed to the interests of the working class and socialism. The attempts of the leadership of the League of Communists of Yugoslavia and all their propaganda to explain the Hungarian events as “a popular revolution of all the working masses”, brought about not by the enemy but by “the bureaucratic political system and by the mistakes of the Rakosi-Gero clique”, not only have no foundation but are a hostile attempt to obscure events, to conceal and negate the class struggle, to deal a blow at the system of people’s democracy, to sow confusion among the ranks of the communist and workers’ parties, to lull to sleep their vigilance against the enemy. a) After the 20th Congress of the Communist Party of the Soviet Union, the opportunists and enemies of Marxism-Leninism in Hungary, under the banner of the struggle against “Stalin’s mistakes” and of spreading the “Yugoslav way” as the “only correct way of building socialism”, launched a big propaganda campaign to discredit the Hungarian Workers’ Party and to split the Hungarian party and state organizations. Parallel with this, a wide campaign was launched for the rehabilitation of Imre Nagy, placing him at the head of the Hungarian party and state, as a man “unjustly persecuted”, as “the man who should lead Hungary in the new situation”. All this campaign was strongly backed by the Yugoslav press and the Yugoslav leaders. Before the outbreak of the counterrevolution, the Yugoslav press was filled with news and articles about the activity of anti-Marxist elements, about the hostile activity going on at the “Petofi Club”, and about all the anti-Soviet, anti-socialist and revisionist work going on at that time in Hungary. The Yugoslav agents in Budapest enjoyed full freedom of action, and together with the various groups of anti-party elements, carried out a wide-ranging campaign about the “specific construction of socialism in Yugoslavia”, thus undermining the position of the Hungarian Workers’ Party and the people’s government. b) When the counter-revolution broke out, the Yugoslav leaders were the first to greet it, through their press and through direct messages from Tito, as a “people’s revolution”. While all the Marxist-Leninist parties openly denounced the counter-revolution and Nagy, the Yugoslav press continued to defend the Nagy government. The Yugoslavs had stationed their troops along the Hungarian border, ready to move them into Hungary. As they themselves have officially stated, if the Soviet Army had not intervened on November 4, they would have moved their troops into Hungary. This is how far things had gone. The entry of the Yugoslav army into Hungary would have greatly complicated the international situation. At the time when the fascist counter-revolution had broken out there, Hungary, a member state of the Warsaw Treaty, was to be attacked by a foreign army. In that case, the member states of the Warsaw Treaty, including the Soviet Army already in Hungary, would have had to liquidate this hostile attack. It was only the aid of the Soviet Army in suppressing the counter-revolution that averted this international provocation. c) When the counter-revolution was smashed, the Yugoslav leaders maintained a hostile stand against the Soviet Union, denouncing the aid it gave the Hungarian workers to suppress the counter-revolution, and described it as “intervention”. Imre Nagy, who called on the imperialist troops to come to his assistance, and who certainly counted on the intervention of the Yugoslav troops, too, under whose leadership fascist bands murdered and hanged thousands of communists and workers, found shelter in the Yugoslav legation in Budapest. The Yugoslav leaders and their propaganda were bitterly opposed to the reorganization of the Workers’ and Peasants’ Revolutionary Party and to the strengthening of the dictatorship of the proletariat. Kardelj came out openly against the steps taken by the Hungarian government. He demanded that territorial councils of workers (filled with counterrevolutionaries) should take power, and called on the Hungarian leaders to radically change the political system in Hungary. Taking into account that socialism was being built during the years prior to the counter-revolution, it is clear that Kardelj’s demand for “radical change in the political system” means simply the liquidation of the dictatorship of the proletariat and the re-establishment of the capitalist system. In short, the attitude of the Yugoslav leadership and press cannot be considered as anything else but interference in the internal affairs of Hungary, in order to hinder the Hungarian party and government in eliminating the remnants of the counter-revolution and normalizing the situation.